A key property of many sounds, and in particular those that we think of as music, is the pitch. In the context of music, the American Standard Association defines the term pitch as “that attribute of auditory sensation in terms of which sounds may be ordered on a musical scale.” As such, it is strictly speaking a perceptual phenomenon. It is, however, caused by physical stimuli that exhibit a certain behavior. Signals that cause the sensation of pitch are, broadly speaking, the signals that are well-described by a set of harmonically related sinusoids, meaning that their frequencies are approximately integral multiples of a fundamental frequency. Signals that have frequencies that are integral multiples of a fundamental frequency are what is commonly referred to as periodic. We have already discussed such periodic signals extensively in connection with comb filters, Fourier series, and phasors. Pitch is, of course, of interest in and of itself in music, as it is the essence of music, but it can also be used for many things in audio processing, such as auto-tuning, harmonizers, intelligent pitch shifting, and much more. 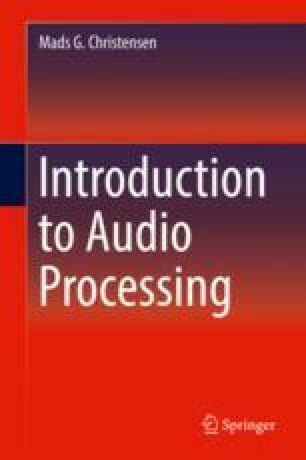 Thus, no audio processing book would be complete without a chapter about pitch estimation!